View floor plans for our East Mt. Airy apartments. Willow Bend offers the best in space and amenities whether you’re looking for a one or two bedroom apartment. Each apartment at Willow Bend has energy efficient appliances, spacious closets, individual climate control, and modern lighting. 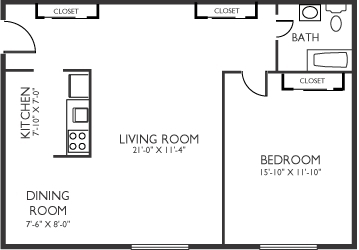 Our apartments have separate kitchens and feature hardwood flooring in select units. Our community is pet friendly, so bring Fido and Mittens with you! See our pet policy for restrictions. We also offer on-site laundry facilities and controlled access for an extra layer of security. Our homes are nearby to public parks, public transportation, several academic institutions, and many dining and entertainment options. Call Willow Bend today to schedule a tour of our East Mt. Airy apartments!